This Hotel is beautifully located at the beach front, close to restaurants, shops and the port. Beautiful building with a very nice room for breakfast overlooking the sea. The staff is helpful and welcoming. The indoor decoration is quite dated and we would prefer some vegetables for breakfast but in all we recommend staying here! 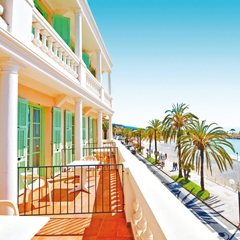 my wife and I have visited the Balmoral, Menton, for three summer vacations. We've had a small suite (two rooms and a balcony) each time, with air condition. The hotel is quiet, superb located in the center of Menton, and not expensive compared to the comfort given. We may return for a fourth summer. Great location on east end of the public beach. Most rooms are small with little or no balcony, but there are a couple with a bit more comfy layouts. Air conditioning worked well, which was a lifesaver in summer! Included breakfast was very nice, and the staff friendly and helpful. Full bar and restaurant on site. Wonderful view of the sea and promenade. A good hotel with excellent location for reasonable price. Friendly staff. Good breakfast but with a limited choice of food. My wife and I stayed two summers there and keep very good souvenirs. A wonderful hotel to stay at. Nice stay in excellent location in a beautyfull room with French balcony and partial seaview. Will reyurn next summer. This web-user gave a score of 4 / 5 to Vacances Bleues on july 2018, but declined to leave a comment.